Allied Academies Conference (AAC) takes great pleasure in inviting all the contributors from across the world to appear “International Conference on Otolaryngology” during September 05 - 06, 2019 at London, UK. Otolaryngology Conference 2019 has been planned to gather all the world class Scientists, ENT Doctors, Researchers, Otolaryngology Specialists and Business Professionals under one roof to converse the newest topics in Otolaryngology Specialist. This Otolaryngology 2019 Conference with the theme ‘Scientific Progression and Novelty in Otolaryngology’ will report the world’s major challenges that are handled in the field of Otolaryngology by the most important persons around the globe. Otolaryngology 2019 Conference strategies are the best platform for the Scientists, Young Researchers, Doctors, Professors and Business Professionals to admit their knowledge and involvement. Otolaryngology Conference 2019 has taken a massive effort to fill the floor with all the active sessions such as but not limited to Entire discussions, Important performance, Oral presentation, Poster presentation, Exhibitions and Workshops where the finest research will be honoured with young scientist reward and best poster reward. We have organized the best platform to get knowledge, share your proficiency, receive acknowledgement, networking and the certificates signed by the most well-known organizing committee member. · - Take advantage of opportunities to learn insights about Otolaryngology from a variety of oral and poster presentations. - Meet and network with Otolaryngologist ranging from students to Deans, Faculty, and Researchers. - Take advantage of opportunities to collaborate with Otorhinolaryngologist from around the world. - Attend prominent plenary sessions about relevant issues affecting ENT care and the recent techniques adapted in ENT. Join at London for Scientific Progression and Novelty in Otolaryngology! Allied Academies Conference 2019 intentions to discover the maintenance in the field of ENT Otolaryngology, healthcare, education, research area as well to penetrate deeper into various topics of Ear, Nose and Throat. Based on the reports, the job demand for otolaryngologist would experience a sharp increase by 2022 all over the world. As would be expected, wealthy countries like the U.K., tend to spend more per person on Pediatric Otolaryngology. ENT Surgery performed in an anatomical area outside the Otolaryngology not primarily relating to the treatment of conditions involving ENT is normally considered to be outside the scope of Otolaryngology Treatment. As health care facilities rely more and more on Ear, Nose and Throat medical information so the need for Otorhinolaryngologist will tend to involvement more. “International Conference on Otolaryngology” greetings all the challenger globally to appear our highly dedicated event scheduled to be held on September 05 – 06, 2019 at London, UK. Otorhinolaryngology conference highlights the new technology in the ENT Disorders, Facial and Neck Surgery, Implant surgery and all related subjects. Otolaryngology goal is to gather the top Societies, Industries, Researchers, ENT Doctors, ENT Specialist, Industrialists, Young Scientists and Professionals from top Otorhinolaryngology Universities around the world to fill the floor with Keynote presentations, Oral talks, Poster presentation and Exhibitions. This conference gathers everyone to devise the great platform for International symposium, B2B meeting and International workshops. Otolaryngology diseases can be an excessive threat to our most significant senses like smell, hearing and taste. This Otolaryngology conference gathers the world’s best Physicians, Doctors, Surgeons, Researchers and Business Professionals to share their enormous knowledge to explain the greatest complications in the field of Otolaryngology. Otolaryngology Conference consists of attractive sessions in the field of Ear, Nose and Throat. The goal of this conference is new developments in ENT. It will be more useful for Otolaryngologist (ENT Specialist) and research scolors to gain their profession knowledge. Target Audience: Academic Researchers, Associate Professors, Clinical Researchers, Entrepreneurs, Healthcare companies, Healthcare Innovators, Physician, Surgeons, Professors, R&D Companies, Research Scholars, ENT Specialists, Public Health Specialists, Internal Medicine Physicians. The paediatric Otolaryngology serves complete care for children having problem with ENT Otolaryngology. This session focused the prevention and treatment for most common care ENT ailments in children such as Sinusitis and Ear Problems. Anaesthesia treatment regulate the loss to physiological principles are caused due to pain. Around one-third of all the patients who suffers ENT surgery are kids. The Otolaryngology action like myringotomy to a surgery like reconstruction. Anaesthesia mentions to the following of administering medications by injection and inhalation that restrict the feeling that produce a deep state of unconsciousness that rejects all feelings. The spectrum of Otolaryngology surgery is simple actions such as tonsillectomy to care laryngology, neurotologic, and image-guided skull-base surgery, complex obstructive sleep apnea (OSA) surgery, sophisticated Transoral Robotic Surgery (TORS), and major Otolaryngology surgery with free-flap renovation. The field of otology is a specialty within Otolaryngology that attentions on diseases and illnesses of the ear. Oral antibiotics are usually prescribed for the treatment of otitis. Patients with recurrent disease are often treated using a Otolaryngology medical technique to insert tubes through the tympanic membrane. The typical treatment of antibiotic ear drops needs multiple drops two times per day. Laryngology is the study of purpose and illnesses of larynx. The voice box parks in the neck and contains the vocal cords. The larynx is responsible for sound creation and swallowing. Allergy or Allergic diseases are caused due to the sensitivity of the immune system to the harmless element present in the atmosphere. Allergic diseases cause symptoms such as red eyes, itchy rashes, runny noses, breathing shortness, and swelling. Neurotology is a scientific medicine concerns with the part of nervous system which is connected to ear. Neurotology is a field of head and surgery, it is related to otology. Otology deals with the middle ear disease treatment and subsequent conductive hearing loss and neurotology is the treatment of inner ear, hearing and balance disorders. This track discusses the Vestibular Neuronitis, Facial Nerve Paralysis, Hearing Loss, Deafness, Vertigo, Perforated Ear Drum and Neuro Otolaryngology. Otolaryngology is the study of the ENT contains the cancers in the mouth, larynx, pharynx, salivary glands and nasal passage. It also affects the ear drum and other related area to the ear nerves. Head and Neck cancers form in the squamous cells. Head and neck are lined with the cancer cells with the mucosal position. These cancer cells are named as squamous carcinoma. This session will confer the innovative medical diagnostic testing and medical surgical treatment for the possibility of Otolaryngology conditions like squamous cell carcinoma, Head and Neck Surgery, HNS Oncology, Head and Neck Cancer Virus, Carotid body tumour and Oral Epidemiology. 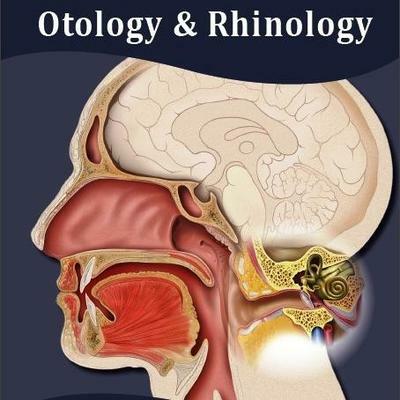 Otology is the study of ears, nose and throat. Pediatric ENT are the most important part of the body which are used each day. Ears are not only the sensory organ that include in hearing ability but also the sense of balance. The nose is not only the organ to smell but involves partly in taste. Other role of the nose is moistening air and protecting germs from entering body. Throat is an essential organ which provides the path for air to reach the lungs and food and water to reach digestive tracks. Any disorders in Otolaryngology may disturb your quality of life and leads to medical emergency. 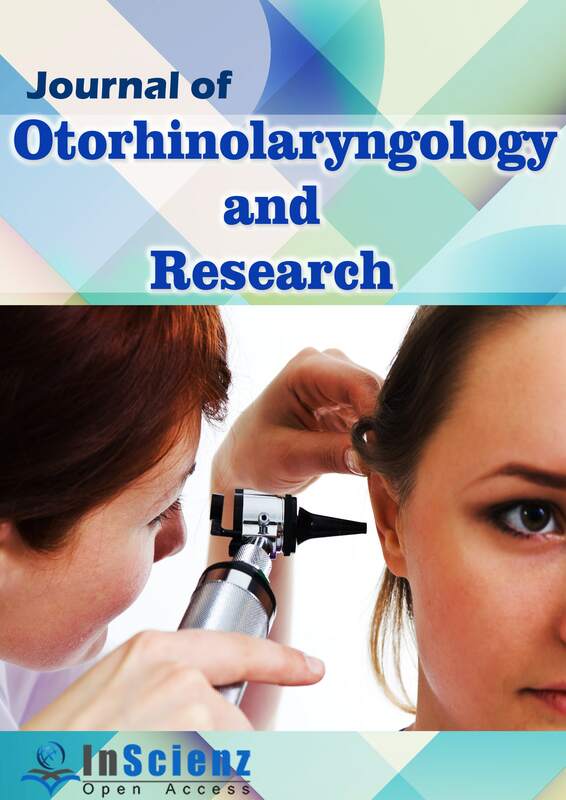 Otolaryngology offers more well in research practices in behavioural sciences of Otorhinolaryngology. This comprises all the new technical growth in laryngology, otology, Rhinotology and paediatric ENT. Advancement in Otolaryngology delivers a best platform that guides to gather and spread art for scientific otolaryngology. Otolaryngology Disorders is common to make the nasal endoscope with the advanced knowledge without incisions. This session confers the surgical, intraoperative imaging, endoscopic uses in orbital, septoplasty, ossicular chain rebuilding and management of superior canal. This session reports the endoscopy and diagnosis techniques which is a nonsurgical practice and used to display the patient digestive path. The endoscopy techniques are used to view the digestive tract with the help of light and camera attached to it. The varying angles of the patient’s body can be imaged at comfort using the Otolaryngalogy techniques. Antimicrobial therapy detect the growth of microorganisms like bacteria, fungi, or protozoans. Most of the therapies are destroy the microorganisms are known as microbiocidal therapies. Antimicrobial drugs can be grouped according to the microorganisms they act primarily against compared to other. Antimicrobial agents remove bacteria by various methods. Most antiseptics bacteria are suddenly causing by the bacterial cell to shatter. Endoscopic surgery uses scopes going through slight incisions or natural body beginnings in order to analyse and treat ENT otolaryngology disease. Alternative general term is Minimally Invasive Surgery (MIS), which highlights that analysis and treatments can be done with compact body cavity invasion in Otolaryngology. Pathology is the study of the origins and effects of disease or injury. The overall analysis and research, pathology addresses four mechanisms of disease origin, mechanisms of development physical alterations of cells, and the values of changes. General pathology is frequently concerned with analysing clinical irregularities for both infectious and non-infectious disease and directed by experts in one of two major areas like anatomical pathology and clinical pathology. The argon laser has verified to be a valuable tool in stapes surgery. Improved continuing hearing results, safety and ease of small fenestra stapedotomy are the basis of its popularity. Carbon dioxide (CO2) and Potassium Tetanyl Phosphate (KTP) lasers are entering the ENT Otolaryngology literature with good results. Pathologic difficulties such as obliterative otosclerosis and hard circumstances such as revision stapes surgery can be more efficiently and safely achieved with the use of Otolaryngology lasers. The Clinical case study and the importance of Otolaryngology is being enlarged enormously due to the outcome of large number of Neurological disorders. 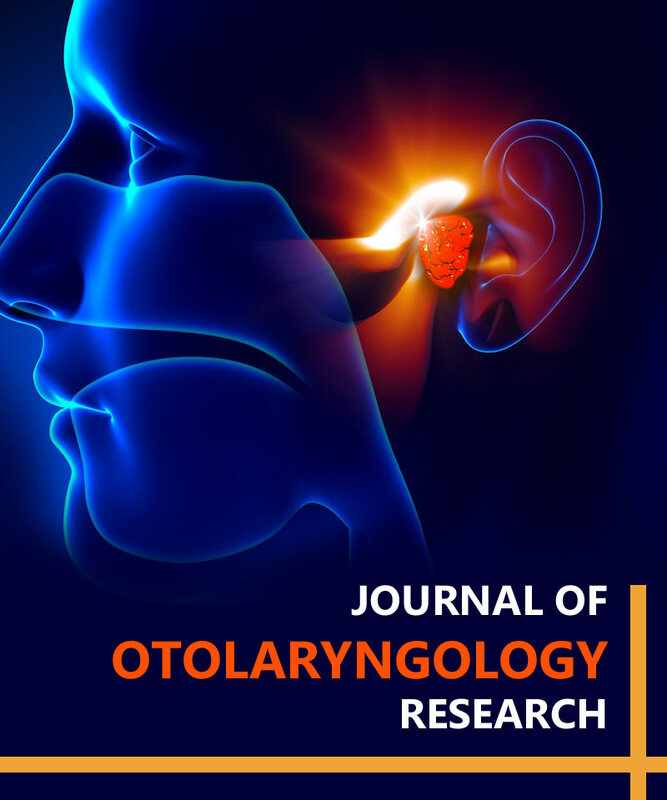 The field of otolaryngology is focusing on the latest advances and their potential impact on the treatment of ENT otolaryngology diseases and disorders. Scientific Advancement and Revolution has increased the development of medicinal industries in the market for the treatment of Otology. Otology case reports refers to the investigation of Otolaryngology like prevention, diagnosis and treatment data. These case reports help in gaining knowledge about Otolaryngology and to develop subsequent treatments. Otolaryngology which deals with ENT are the most essential parts of the body which are utilized every day. ENT diseases are a great threat to the most important senses, that includes, Hearing, Taste and Smell. According to the evaluations of the Centre for Disease Control and Prevention are facing the sinusitis which makes this disease more common than Diabetes and Asthma. This highly pervasive disorder developed the interest in Otolaryngology medication. The market of Otorhinolaryngology medication has been augmented by increase in the Otolaryngology disorders and lung illnesses. Ceaseless Obstructive Pneumonic Infection as the fourth reason for death worldwide in Otolaryngology and it is believed to acquire third position in 2020. The reports accounts that around 64 million individuals were experienced by COPD. 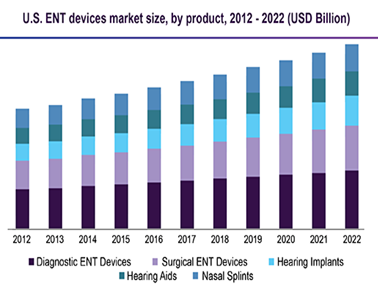 The market value of ENT devices 9,595 million USD in 2015 which is estimated to reach 14,001 million USD in 2020. There are around 8600 hospitals and study centre for Otorhinolaryngology. Otolaryngology is the branch of medicine deals with analysis, treatment and other problems related to ears, nose and throat, as well as the neck and larynx. 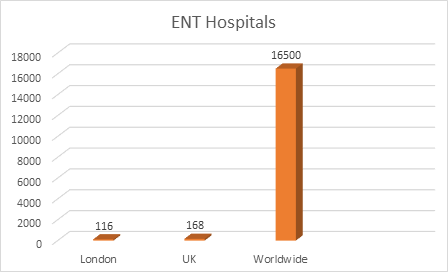 Increasing use of some of the electric systems is partly caused by the increasing attractiveness of access control systems which take less time for analysis, treatment and less damages through the time of ENT surgery with pain. Increasing age leads to development risk for Otolaryngology ailments. This results in the use of advanced laser and radio frequency technology over surgical and diagnostic procedures and is expectable to drive ENT devices market size quickly in coming estimate periods. London has a miscellaneous range of people and cultures, which make this city as the centre of attraction for tourists for a long time. London stands as the capital of England and the United Kingdom with the population rate of 8.6 Million. London creates a rich antiquity in academic with topmost class medical university and greetings the students worldwide. London owns five major school of medicine - Bart’s and The London School of Medicine and Dentistry, King’s College London School of Medicine (the largest medical school in Europe), Imperial College School of Medicine, UCL Medical School and St George’s, and University of London. London is the native place for numerous Medical schools, Best hospitals, Research institutions, Laboratory and Other facilities makes it the best place for scientific conferences. London keeps you busy for endless days with all its Royal places, Castles and Cathedrals without running out of the unique places. Allied Academies Conference purposes to have one Otorhinolaryngology center or clinic for every residents of London. An Otorhinolaryngology association is a professional organization. They are regularly based on field and are usually national or regional associates. These Otolaryngology associations usually offer conferences and continuing education. 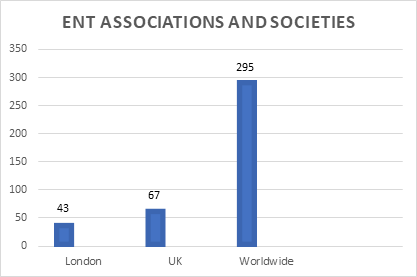 ENT Associations and Societies often serves in capacities like trade unions, and take public policy pose on health issues. All registrations, after payment of complete registration fee, are transferable to other persons from the same organization, if in case the person is unable to attend the event. Request for transfer of registration must be made by the registered person in writing to contact@alliedacademies.com. Details must include the full name of replaced new registrant, their title, contact phone number and email address. All other registration details will be assigned to the new person unless otherwise specified. This cancellation policy was last updated on April 01, 2018.